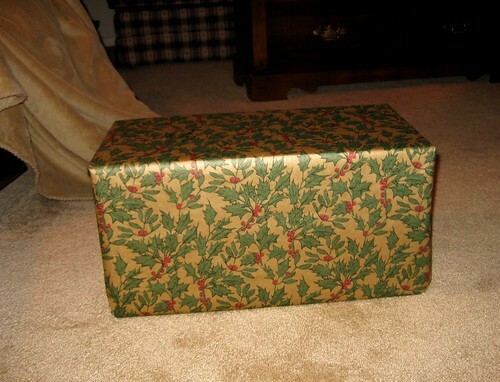 Michael and I had a wonderful time exchanging gifts this Christmas. I had a blast finding/buying him things that I knew he would love. I added this picture because of his forearm veins. You understand. I got him a new watch! 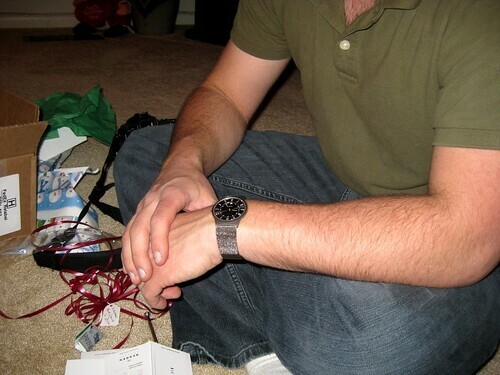 He has this obsession with metal links pulling his arm hair, so we had to find a watch without metal links that wasn't a leather band. Skagen makes a metal mesh band that is super light weight. Perfect. And it looks so good on him.... it's a gift for me too. 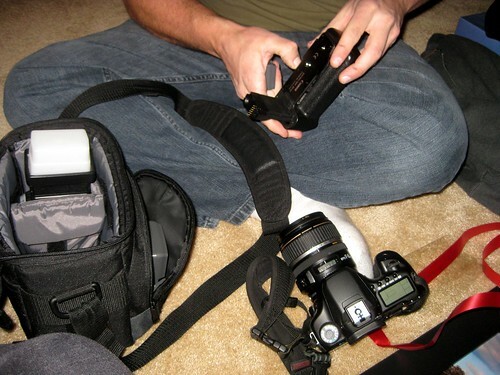 I also got him a new battery grip for his camera. This was my first ebay purchase ever. And a total disaster. So I ordered another one! And paid for super fast shipping. And it was here for him to open and enjoy. I'm hoping the first one I bought will eventually find it's way to me. That would be really awesome. If not, I take it as a lesson learned. 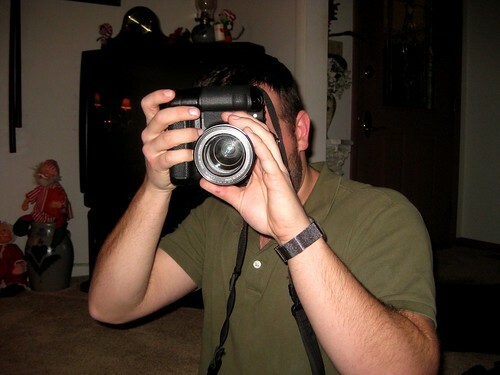 He put it on his camera right away. I was so glad to see him using it. I also bought him a sweater that I wanted to see him in. Totally guilty of buying things just because I want him to wear it. And he bought me a Kindle!!! Wooooop! I am enjoying it so much. I couldn't wait to travel with it, put it in my purse, take it with me everywhere... 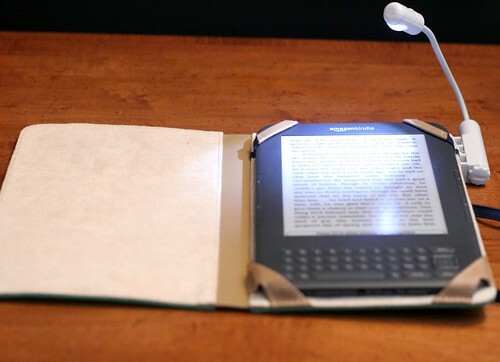 So I just recently got myself a cover and booklight. I am such a nerd. 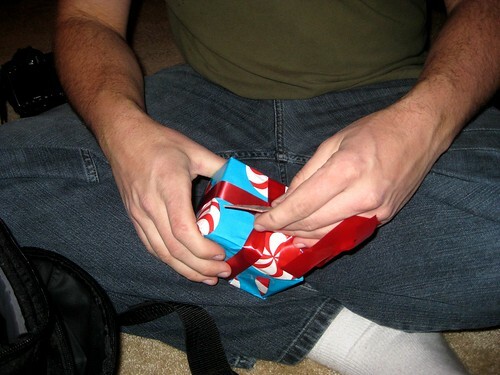 This is the last present I opened from him. He told me he made it. The tears were already starting by the time I actually got to it. He made me a jewelry tree! 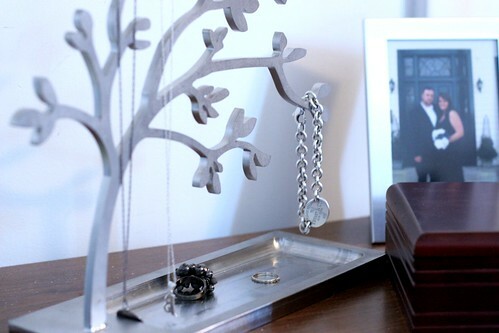 I can hang my necklaces and bracelets from the branches and put rings in the bottom. Isn't it lovely? I just adore it. 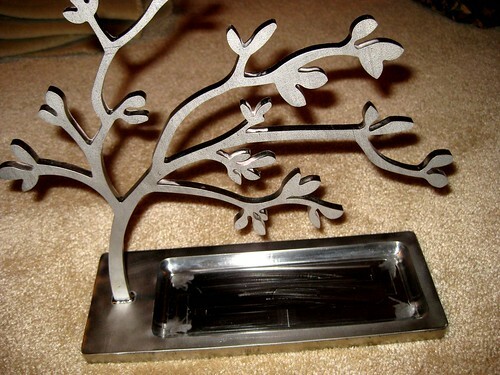 He designed the tree himself and had it cut out of a sheet of stainless steel on the laser machine at work. Do you guys know that Michael is a project manager for a metal fabrication company? That would help understand why he could make me this at work. I probably should have told you that before. Moving on. He spent hours on this project and brought on a bunch of other guys at Miller Metal to help it all come together in time for Christmas. It's made of stainless steel, so Michael says it will never rust. I will have it sitting on my night stand for the rest of our lives. I can't wait until I get to write that blog post. Can I have a Jewelry tree too please? Or at least a Michael? The jewelry tree is absolutely beautiful! What a wonderful man you have in your life that made you a gift --- those are the best gifts! 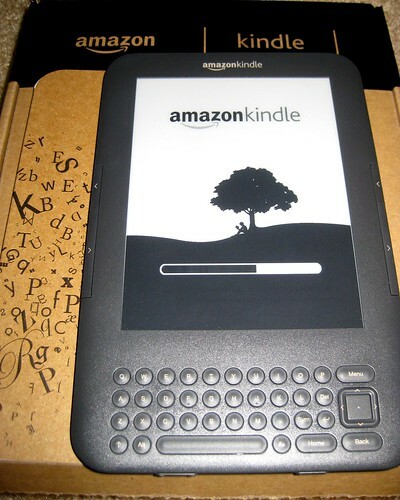 Glad you are also enjoying your Kindle (I love mine and have become addicted to scrabble on the Kindle) . . . there are some great blogs for books! Aww. I love the last 2 lines! I always maintain that I love homemade gifts but this takes it to a whole new level! That necklace tree is gorgeous! How cool is that jewelry tree!!! !